Baby chipmunk found by Leighton Miller in September 2008. Photo by Leighton Miller. Although it doesn’t feel much like it yet, spring is here, and all the birdies and beasties are getting ready to have their babies. Due to the abundance of parkland within the city as well as the constant real estate development nibbling on the borders of their natural habitats, wild animals are closer to us than ever. 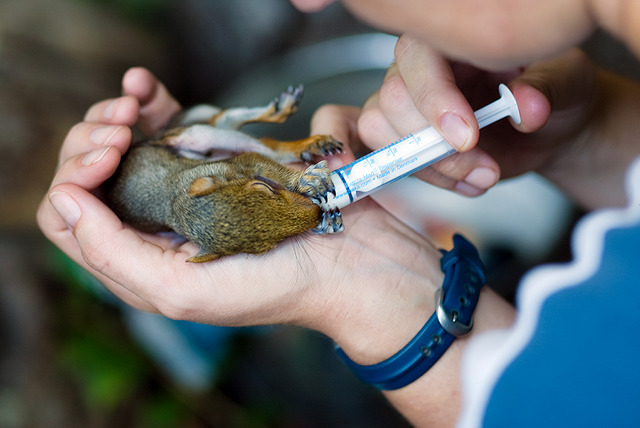 For this reason, the Toronto Humane Society—mostly known for rescuing cats and dogs—runs a Wildlife Rehabilitation Centre where people can bring injured or immature wildlife found in the city at any time, day or night. Wildlife Rehabilitation Centre at the Toronto Humane Society. Photo by Kaori Furue/Torontoist. The Humane Society has always accepted non-domestic animals into their care—raccoons, squirrels, rabbits, birds—but just last year they officially opened the centre due to an increase in the number of critters being brought in. Jiha Humayun, shelter supervisor, and Ian McConachie, senior communicator, showed us the renovated area that has both an indoor room (for keeping baby animals warm) and an outdoor space with trees and logs that mimics a natural environment. Outdoor space at the Wildlife Rehabilitation Centre. Photo by Ian McConachie. I let the doggies out for a pee and noticed this little fella crawling around on the ground. We tried to leave him within a few feet of the tree with his nest but his mom never came for him. I think we will run him over to the Humane Society in the morning if they agree to take him. Miller told us he hadn’t heard of the Wildlife Centre before finding the chipmunk, but he went online and found out what to do, which was to leave him for twenty-four hours to give the mother a chance to find him. 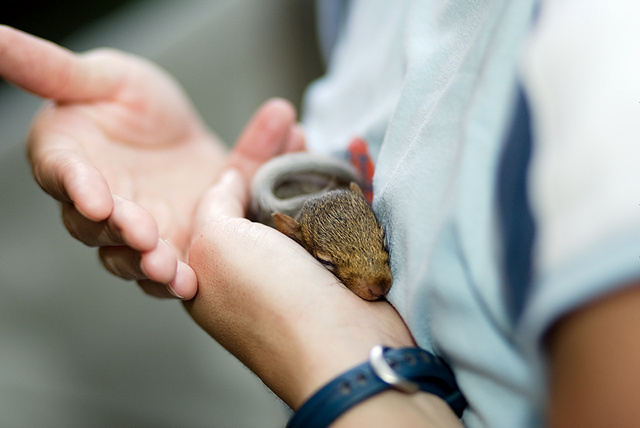 This wasn’t the case with Miller’s chipmunk, but unfortunately many uninjured baby animals are brought to the centre that should have been left alone. For example, baby birds leave the nest before they can fly and practice by hopping around on the ground. The mother birds fly between the babies who may be located in several separate backyards. It’s easy to assume the little ones are abandoned. Bringing them in can end up causing unnecessary stress in addition to burdening a facility that is always at capacity at the height of spring. If you find an injured or immature animal and are unsure of what to do, consult the Wildlife Centre’s website for detailed information. Then, before leaving with the animal, call the Humane Society at 416-392-2273 for further instructions. Regular hours are between 10 a.m. and 6 p.m., but someone will be available 24/7 to answer questions. Also note that, despite how cute they are, it is a very bad idea to adopt a wild animal. Humayun says, “You will inevitably discover the creature is unsuitable as a pet, and by then it will have lost its survival instincts.” As much as possible, please leave the wild things where they are.